Four years ago, the Algerian energy company Sonelgaz bought 34 gas and steam turbines from GE to help bring power to millions of people across its desert and urban landscapes. The turbines can generate 8 gigawatts of electricity, the equivalent of powering roughly 8 million average Algerian homes. They increased Algeria's generating capacity by 70 percent. But it turns out the country needed more to power its growth. GE and Sonelgaz have just signed a new agreement valued at more than $3 billion to upgrade its power plants and train local workers over the next 20 years. It's the largest contract in history for GE's Power Services business and the second multibillion-dollar deal with Sonelgaz in less than half a decade. With today's announcement, GE will provide operations and maintenance for a further 11 gigawatts (GW) of power. The deal is also an important one for GE Digital, GE's software business. GE Digital's software running on Predix, the software platform GE developed for the Industrial Internet, will run inside 10 Sonelgaz power plants. Engineers will be able to analyze data drawn from thousands of sensors throughout the plants to predict outages and identify inefficiencies. The software could increase each plant's availability and output by up to 10 percent. "Five years ago, Sonelgaz made the decision to add significant power to their grid," says Joseph Anis, president and CEO of GE's Power Services for the Middle East and Africa. "Then Sonelgaz quickly realized these were technologies that needed support to maximize their value, and this is where the best of what GE can offer came into play to help." 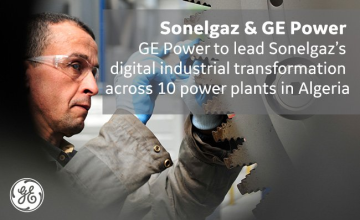 GE will collaborate with Algeria's Sonelgaz SPE, a subsidiary of Sonelgaz, in a deal that will lead to the digital industrial transformation of Sonelgaz's plants throughout Algeria and strengthen local capabilities. It will be the largest services deal and the second largest Industrial Internet software deal in GE Power's history. The landmark deal highlights GE's Fleet360* total plant solutions capabilities. Read more. More about GE in Africa in this BRIEFING. GE has been in Algeria for more than 40 years and has over 700 employees in the country today. The company now plans help local workers maintain and eventually upgrade the GE technology. "With this agreement, we're going to train skilled Algerians on how to operate and maintain their plants properly," says Anis. "Some people [from Sonelgaz] will be trained on the actual physical maintenance that needs to happen. Others will learn how to manage the complex machinery used in operations rooms to monitor power plants, as well as the software that tracks turbine machinery to make predictions and find efficiencies." More broadly, the new collaboration between Sonelgaz and GE can help the Algerian government diversify its economy and boost productivity, supporting stability and enhancing the nation's expertise in power generation. "For the country, it's important to be able to develop their local capabilities and reduce their costs for long-term success," says Anis. The partnership will help Sonelgaz save as much as $2 billion in gas that it can sell into international markets over time. That's because GE will also be providing Sonelgaz with its Advanced Gas Path (AGP) upgrade, replacing the inner section of their turbines with higher-technology parts. AGP will help unlock an additional 420 MW — enough to power nearly 1.5 million homes. "The Algerian government and Sonelgaz have a clear vision for the future of the country's power sector," says Steve Bolze, CEO of GE Power. "The emphasis on building industrial capacity and the focus on the digital transformation of power plant assets are long-term investments in the future of the country." Copyright © 2017 GE Africa. All rights reserved. Distributed by AllAfrica Global Media (allAfrica.com). To contact the copyright holder directly for corrections — or for permission to republish or make other authorized use of this material, click here.